This is the Rihanna wig -- isn't it pretty? Not Rihanna the singer, Rihanna the wig. If you’ve followed my blog, you would have read that I was planning to purchase Shake-N-Go FreeTress Equal Wig Rihanna during my trip to NYC. After my shopping on Wednesday, I was already pretty satisfied. I had planned to help my cousin with Thanksgiving dinner, while the mens dem enjoyed football, but my cousin’s son had other ideas. He decided to take The Hubby and I to Jamaica Ave.
We got into the car and headed to Walmart. I must admit, I’m not a fan of Walmart — and the Walmart we were at was the same one that the security guard was trampled to death at on Black Friday 2008. Suffice it to say, I wasn’t all that excited about visiting Walmart. The Hubby wanted to check the prices of some electronics he was hoping to purchase on Black Friday. The store was open 24 hours as to not have a repeat of last year’s madness. (I mean, really, what is at Walmart that you need to stampede into the store?). So, I was not expecting the wonderfulness that was Jamaica Ave. in 2009. We started walking and came across a wonderful spot, Rainbow. I found a number of cute work outfits and some thigh high boots for my sister-in-law. But, aside from clothes, I didn’t realize just how many beauty supply shops lined the street. It was a virtual cornucopia! I went into one hair store and I saw the prettiest wig — it was straight with bangs and just above shoulder-length. I had been looking for the Rihanna wig in every hair store and hadn’t seen it. I touched. It was soft and the hair fell nicely at the back. “Do you have it in 1B?” I asked. “Really?” Hmmm… not bad. “Hold on — I’ll be right back.” I hustled outside to get a cool $10 from The Hubby — I had already spent a good chunk of the money I had on me on clothes. The Hubby and my cousin were outside waiting for me. Neither one wanted to be in a hair store looking at wigs and products with me. The wig looks busted in the picture -- maybe it's the model, I don't know. What I saw was a whole lot cuter than this photo. I got the cash and a few minutes later I was the proud owner of the Glance Synthetic Fullcap Wig, Korina. If I can’t have the Rihanna, Korina will have to do. With my clothes and wig, I was happy — even before Black Friday. At that point, I was good with window shopping and enjoying the rest of the day. A block or two down the street, the men saw a White Castle and I saw another hair store. This one was large. I left them to buy fries and drinks and I went inside. Guy! An entire wall of wigs. 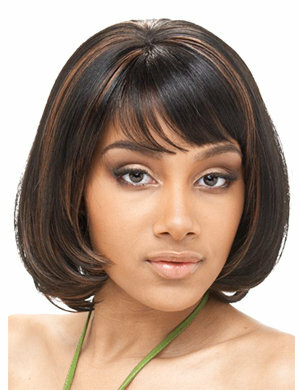 FreeTress wigs! Guess who was here? Rihanna! Finally! I was so excited. I had only planned to buy two wigs — a curly one (which I got on Wednesday) and a straight one (which had just been purchased). Did I need a third wig? The Rihanna was cute though and the back wasn’t strange-looking — that was what I was concerned about. I reached up and touched it. Why did the hair feel so dry? This was my fear confirmed. Some wigs just look and feel wrong — dry and brittle, as if the manufacturers found the hair that was most similar to hay and used that. A feeling of disappointment washed over me. The woman who was working there — finally, a Black woman in a hair store — asked me if I wanted to try it on.